Love is in the air at Just Magnolia!! Just Magnolia have a special prize for their monthly challenge. I'm not going to tell you what it is you'll have to go see for yourself & join in!! The challenge however is "Paper Pleating"
I found this interesting & fun & an easy to use tutorial. 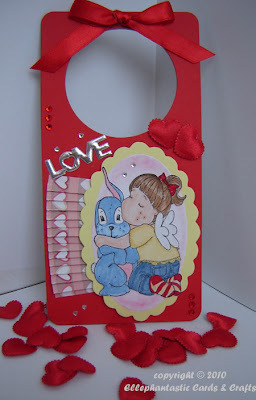 I have used a door hanger kit from Susie's shop Die Cut Dreams & gone with the love theme again. Hello Helen, how lovely is this. Such bright colours and I love that image, so beautiful. Well done. Fabulous sweet door hanger, love the cute Tilda. what a great door hanger, wonderful pleating too. Thanks for joining us this week on Just Magnolia.